50 years in Maritime Patrol Excellence is the subtitle of this print. A commissioned painting for VP-9 in Hawaii, this print depicts the progression of aircraft flown by Patrol Squadron Nine and many other Naval ASW squadrons in their history. 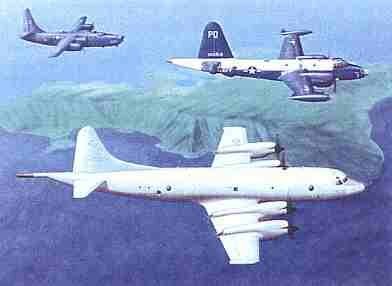 In the foreground is the Lockheed P-3 Orion used by the U.S. Navy since 1962. In the middle distance is a Lockheed P2V-7 Neptune used from 1945 to 1978 and a Consolidated PB4Y-2 Privateer that was flown from WWII until the 1960's in the far background.